​Located in the constellation of Auriga, the Flaming Star Nebula (IC405, SH2-229 or Caldwell 31) is approximately 1500 light years away. The Tadpoles (IC410) are located at approximately 12,000 light years, so despite looking like neighbours, these two are not. IC417 and NGC1931 are approximately 10,000 light years from earth. They are both young star clusters still embedded in glowing hydrogen gas and dust. 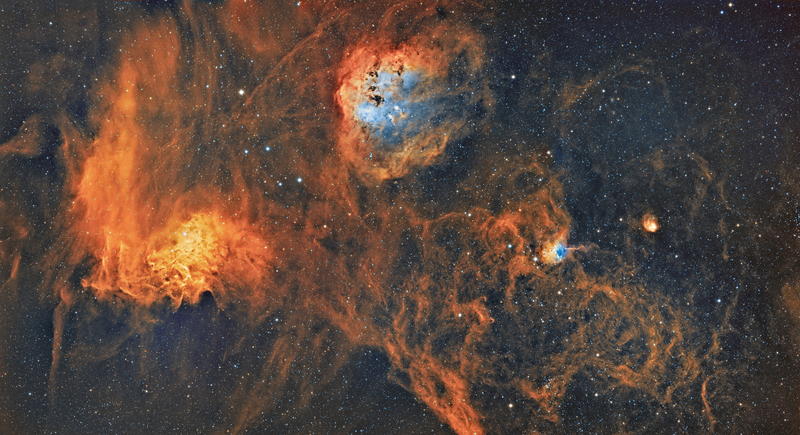 This is a 6 pane mosaic, processed in a bi colour palette using Ha and OIII. This image has been used in the 2016 calendar for the Costa Blanca Astronomical Society.